“Healing must take place before you are able to deal with your matter. Chiron is not a planet but a comet with a unique orbit that travels through the entire Zodiac over approximately fifty-one years. ‘Chiron’ is the Green word for ‘man-horse.’ In myth, Chiron the centaur, the wisest of all creatures, was the wounded healer and self-enlightened shaman. He was wounded in the flank and was almost crippled, but was rehabilitated from his wounds and sickness to pursue the healing arts through the guidance of Apollo, god of light. For astrologers, Chiron has a special purpose as a bridge between the inner and outer planets, a bridge between the animal and the human – the wisdom that lies in both life forms. In the chart, Chiron’s place shows transition linking the mundane to the extraordinary. This heavenly body takes us on a journey through our darkness, where we pass through to the next side with strengths we did not realize we had until we pass through that black place. 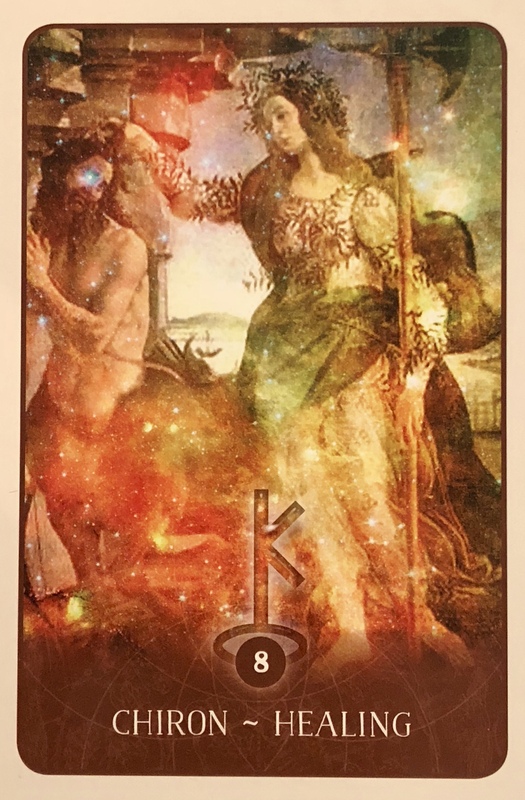 Chiron has a relationship to the two astrological signs of Virgo (health and physical well-being). Chiron lords over matters of health, illness, and disease, and especially how they relate to our personal journey through life. One must see darkness before there is light. One must experience sickness before there is lasting health. Chiron also represents resurrection so has some relationship to the Christ figure as the wounded healer. This is a card of great transformation; therefore, in many ways, you are rising from the swamps. Chrion’s energy says that once we are able to ‘heal ourselves’ we can also take this ‘gift’ (or wound) and learn how to restore others. We can mend our wounds when we embrace, process, and understand the gift of illness or dysfunction. Chiron is also an expert in alchemy, which gives us the ability to transform the mundane into the marvelous. Chiron is a blending of the energies of Saturn and Uranus, meaning ‘just don’t throw out the old.’ There is wisdom there, but you should also embrace the bold and the new. In keeping with this, Chiron also governs quantum physics, medicine and astrology. When this card turns up in a reading, it can indicate health matters or that issues of a medical nature may be of concern. This matter may have to do with health concerns, most especially any emotional healing that is needed. At this time, you may feel yourself visiting or having interactions with health facilities, or any place that has to do with the healing of body, mind or spirit. This is also a time of teaching and learning, so schools my figure in this matter. Certain sorrows of deep past may be surfacing, so be careful of repeating old patterns. These will tend to resurface unless faced directly, and if not faced, the pain will continue. This is an awakening time where you can resolve things. It is not surprising that this card comes now. A very tender subject. Violence and guns… the polarity between the spiritual and material world. Some who believe that humans have the right to bear arms, and others who believe that these very arms are being used as senseless killing machines. There is so much healing that must happen here. And even though it seems as though one country in particular is the one in the crux of it all, we are all One and we all suffer. There are many people around the world experiencing a level of violence and oppression that simply must change in order for us to find a way to live in harmony and peace, to heal ourselves and to sustain life on this planet. There is so much damage and destruction; chaos, uncertainty. But there is an uprising too. There is hope. As the polarities stretch apart, the dark and the light are put in stark contrast. What is no longer working stands out boldly against the desired peace, love and harmony that many of us strive for. At the root of it all is fear. Fear of not being able to protect ourselves. Fear of each other. Deep down somewhere, fear of ourselves. Fear of losing control. Fear of not having enough. How can we fix this? It’s a tough topic to attempt to cover but so very valid right now. So necessary in order to create change. Stick together and love each other. Show as much kindness as you can. Heal the fear and create space for hope and love. Do the inside work and create a more peaceful reality.